Arsenal lined up with a slight alteration to the 4-2-3-1 formation that functioned so effectively against Southampton last week. Aaron Ramsey started in place of Alex-Oxlade Chamberlain, while Laurent Koscielny got his first start of the season as skipper Thomas Vermaelen missed out due to illness. It was a change that made little difference to Arsenal's defensive shape, as Koscielny and Vermaelen are similar in style, the only worry being the Frenchman's possible lack of match sharpness due to having played so little. After Wednesday night's defeat to Real Madrid, Man City manager, Roberto Mancini may have been tempted to go with three at the back. However, that would have been foolish, as it would have left three defenders up against attackers with no fixed position. What was a slight surprise however, was to see Edin Dzeko in the starting XI, partnering the returning Sergio Aguero up front. While Dzeko's recent form has made him worthy of a starting spot, it left City with only Yaya Toure and Javi Garcia in centre-midfield. Even with a force of nature like Yaya in the team, they looked to be a man light. It looked as if Mancini was trying to offset the extra man Arsenal had in the middle, by instructing his attacking players to press the ball urgently, particularly Koscielny and Per Mertesacker. This resulted in a few awkward backpasses for Vito Mannone to deal with. But Arsenal are a team with a high level of confidence, and despite City's attempts to replicate Barcelona's high pressing game, not all of their players are best suited to this. And as Arsenal demonstrated on that glorious night against the aforementioned Barcelona back in 2011, if you can maneuver the ball past the first phase of pressing, you'll have plenty of space in which to hurt your opposition. Not only did Arsenal have Santi Cazorla as an extra man in midfield, but Ramsey often looked to come in off the right flank to leave a 4 vs 2 battle in the centre of the pitch. This left the middle ground clustered on occasions, but Arsenal's passing was sharp, allowing them to dominate the first half. Despite their good use of the ball, Arsenal lacked a cutting edge at the business end of the pitch. Two good scoring opportunities were created; The first for Gervinho via a fine through-ball from Ramsey. The second was for Lukas Podolski after excellent work from the ever improving Carl Jenkinson. Both times they were squandered, the Gervinho chance in particular going astray after an inexplicably bad first touch. With minutes of the half remaining, City earned a corner kick against the run of play. Koscielny was marginally pulled out of position by Vincent Kompany's run, Podolski didn't cover the resultant space, and Joleon Lescott powered his header into the corner. Mannone and Mikel Arteta hardly covered themselves in glory either. Despite their lead, Mancini knew that an alteration had to be made to his line-up. Jack Rodwell came on at half-time for Scott Sinclair, thickening up the City midfield. This helped them get a tighter rein on Arsenal's midfield three. Cazorla in particular found it difficult to influence things as much as he had done in the first 45 minutes. Rather than focus on pressing from the front, City switched to operating with two solid banks of 4 (in defence) and 3 (in midfield) for Arsenal to try and play through. Obviously this was expedited by their one goal advantage, but it was a tactic that seemed to suit the Man City personnel. In the second half against Montpellier, Arsenal looked to be suffering from tiredness in their ability to keep possession. This seemed to be at play here, as the passing lacked sufficient snap to threaten City's defence. While there's a lot to be said for playing with a nominal centre-forward, in certain games you increase your chances of scoring with a fixed reference point in attack. It was unsurprising that Arsene Wenger summoned Olivier Giroud from the bench. What was surprising that he waited until the 72nd minute to make that decision. In the post-match missive on the draw against Stoke, I mentioned that it was a game Arsenal would have lost in seasons past. Well, you could say the same about this encounter with the champions. After having the better of the early exchanges, only to concede, and then look worn down by the exertions of trying to keep pace, it looked like a movie Arsenal fans had seen many times before over the past few years. But this is a team in every sense of the word, and no objective viewer could say Arsenal didn't deserve their late equaliser; a fine finish from Koscielny after City failed to adequately deal with a corner. It was something of a curious game. Arsenal had the better of the first half, but lost it 1-0. City probably edged the second, and lost it 1-0. Wenger's post-match interview showed that he was pleased by the comeback to gain a point, but it seemed laced with mild disappointment that his charges failed to win the match. It's clear that City are well short of their best, and with better finishing, Arsenal could have had a win at the Etihad. But by the same token, few sides go a goal behind to Man City and avoid defeat. 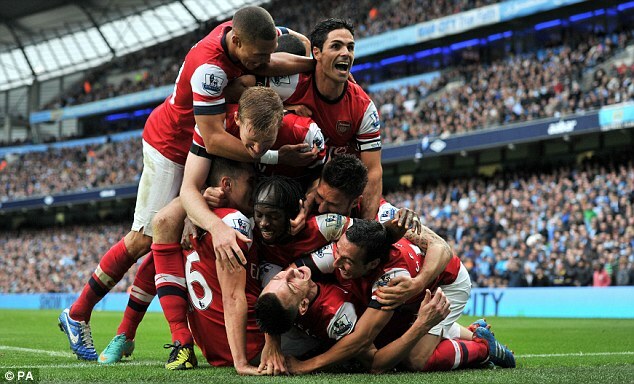 The fact that Arsenal kept fighting to the final whistle shows the heart that beats throughout the squad. Personally, it's been a while since I've been this proud to be a Gooner. The first few weeks of the season have shown that when Arsenal take to the pitch, they may not win, but they will give every ounce of effort available in pursuit of victory.